Plymouth University is helping to improve the standard of mathematics education in Jamaica thanks to an innovative project linked to schools and universities in the country. Academics from the University’s Centre for Innovation in Mathematics Teaching (CIMT) have been working for several years on initiatives to enhance numeracy in the Caribbean nation. And they have recently completed a collaborative pilot project to enhance the skills of teachers from four primary schools in deprived areas of the nation’s capital, Kingston, as a means of overcoming student underachievement. Around 25 teachers were provided with online training in a range of areas, including problem solving and content remediation, with the majority achieving a distinction in their end of study tests. 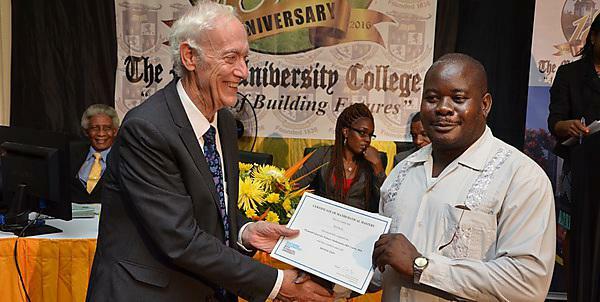 They were recently presented with certificates to mark their achievements at a ceremony attended by Jamaica’s Minister for Education, Senator Ruel Reid. The CIMT has been working in conjunction with government agencies to provide e-learning mathematics courses in Jamaica for almost a decade. This latest project was led by the Caribbean Centre of Excellence in Mathematics Teaching (CCEMaT), a research institute formed in 2014 at Mico University College in collaboration with Plymouth’s CIMT. The CCEMaT’s mandate is to conduct research and training designed to improve the quality of mathematics education in Jamaica and the wider Caribbean. It oversees a range of research and outreach activities, with a specific focus on early childhood, primary and secondary levels.